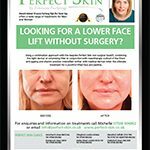 This month I will be looking at how a non surgical Facelift can be achieved with dermal fillers, in recent years the demand for non surgical treatments has grown. I find that clients sometimes fall into the category where they are not old enough or not ready for a surgical approach. The beauty of using dermal fillers to lift the face is that you can go slowly, building up the areas and you have more control over the final outcome. Also they wear off over time and can be used in conjunction with dermal roller, laser or hifu to maximise results and increase the collagen and elastin to the skin tissues. 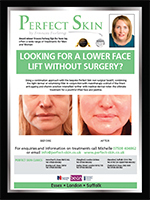 The four point Facelift uses the main areas of the lower face which over time sadly sags and shows volume loss. Firstly lifting the face by augmenting the cheek area is a must, this area is like the shelf of the face, if it is not stable, the lower regions will not lift fully. Secondly I address the nose to mouth lines, I think of this as the supporting scaffold, mid face rejuvenation and restoring the balance of the ‘golden triangle’ will automatically make a face look more youthful. However , one of the most troublesome and ageing features for a person are the ‘dreaded jowls’ or heavy jawline. Personally I like to use a sturdy dermal filler along the jawline to lift the jowls Aswell as lifting the mandible erotically next to the ear area. It gives a natural shaping and definition to the lower face and can help make the neck look less saggy. I tend to choose different types of dermal or volumising fillers, in accordance with age, fat loss and skin integrity. One of my favourite in between dermal filler treatments and to help fight crepey or scarred skin is Restylane Skin Vital booster. It offers a unique approach to nourishing the skin, and works by delivering deep-Skin hydration, improving the skin structure and elasticity, and reducing fine lines and imperfections. The recommended protocol is three treatment 3-4 weeks apart. I find it great on all areas of the face, neck, declottege and backs of hands. Reduce the appearance of skin imperfections such as acne scars. We all should know that the best anti-ageing cream is sun protector, however it can be a minefield knowing which ones are the best and ones that feel good on the skin. Nobody wants to walk around daily with thick white grease on their face! This cream not only shields the skins surface from damage, but also defends the skin from within with its powerful fernblock. This combination means the skin will not only have the maximum protection against UVA , UVB, visible light and infrared -A, but also the free radicals caused by other environmental factors. Like the cream above but suitable for acne, oily skin types, will not give you spots. High protection formula, lightweight, transparent fluid. Offering g a broad spectrum UVA/UVB sun protection. Ideal for sensitive skin, giving a flawless finish.